What would you do if 16 sweaty kids showed up in your kitchen on a hot summer day? A. Panic. B. Ask them to leave. C. Pull out these KOOL-AID Kool Pops. Pour prepared drink into 16 paper or plastic cups. Freeze 2 hours or until almost firm. Insert wooden pop stick or plastic spoon into center of each cup. Freeze 4 hours or until firm. Remove from cups before serving. Prepare using KOOL-AID Sugar Free Grape Flavor Drink Mix. 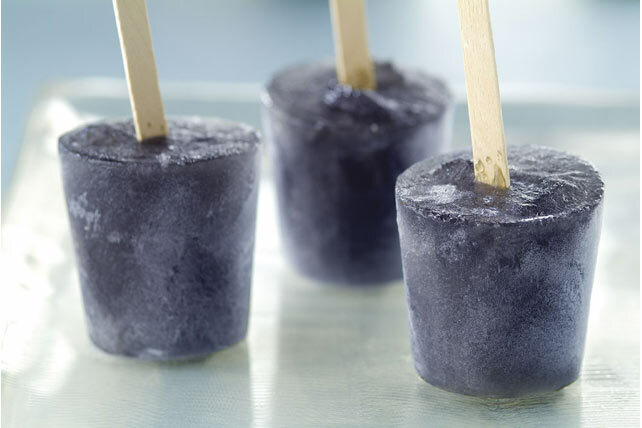 Omit cups and wooden pop sticks; pour prepared drink into plastic ice cube trays sprayed lightly with cooking spray. Freeze 3 to 5 hours or until firm. Prepare using your favorite flavor of prepared KOOL-AID Drink Mix.